Use the 'Add Data: BIOS' input box at top to search for and see list of BIOS datasets. Double click on the list item, or highlight one and hit Enter to add a data layer to the map. The CNDDB QuickView Tool provides public access to basic information taken from the California Natural Diversity Database (CNDDB). A subscription is required to obtain the full, detailed information available in the CNDDB. The CNDDB QuickView Tool results contain "Mapped" and "Unprocessed" CNDDB data at the 7.5' quad and county levels. The "Unprocessed" CNDDB data has NOT been quality controlled and may contain errors. Neither the CNDDB QuickView data, nor the full version of the CNDDB, are to be substituted for pre-project review or for on-site surveys. Please see the CNDDB QuickView Tool user guide for additional information. Click here for more detailed information about the QuickView tool. Select one of the tools below and interact with the map. To make a graphic selection, click on a Method above. To make another graphic selection, click on a Method above again. If you have questions or concerns about fish planting, questions about specific regulations, or questions about where to fish, please contact the Regional Office that covers the county of interest. If there's something you think we should add, let us know! Email fishingguide@wildlife.ca.gov. Quagga and zebra mussels are invasive species capable of causing great damage to the aquatic ecology of lakes, streams, and water conveyance structures. Boaters should anticipate inspections at launch ramps around the state. Remember to always CLEAN, DRAIN, AND DRY! California is a great place to fish! To help you plan your fishing day, the California Department of Fish and Wildlife has developed the Fishing Guide. It allows you to see many of California's excellent fishing spots and learn about various fishing-related activities and information. The Fishing Guide contains fish planting locations that Fish and Wildlife has recently planted or plans to plant in the coming weeks. The Fishing Guide also contains historical fishing locations that at one time provided excellent fishing opportunities. 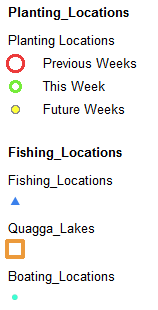 We plan to add additional information over time, such as Fishing Regulations, License Sales locations, and more. If you have a comment or suggestion, please let us know !